The Kingdom HubSpot Case Study - One Year on. How Much Do We Charge? Which eCommerce Platform is Right For You? Why The Change To HubSpot? One Year with HubSpot - How did it go? We first got on the HubSpot demo in November 2015. We thought we would share our experience so far. After demoing and going through the partner accreditation process, we officially began HubSpotting in January of 2015. Our ad agency website was very cool, but also useless. When we started, our average website hits were 400 a month. As an advertising agency, we thought it was cool not to tell the customers what we did. We thought it was all about leaving it to mystique and our portfolio to "make" them call us. This was the completely wrong approach. As a result, we never got the fabled 'contact us' inquiries and had to resort to cold calling to try and get a cut-through in the market. Cold calling failed miserably, yielding only one new paying client in all of 2014, from just three leads. This comes as no great surprise, as cold calling simply does not work in the internet age. Cold calling is interruptive, in an age when we all are online, picking off the items of content that are attractive. So what attracted us to HubSpot and inbound marketing? Like many people, I was seeing the HubSpot blogs and killer marketing content on the internet for some years before really getting interested. I didn't realise it at the time, but inbound marketing was working on me. The inbound methodology centres around providing information and valuable content that helps my audience. These are the core principles of inbound. Help the customer and provide them information that is valuable to them. The real thing that triggered my HubSpot enthusiasm though, was the ability to have your contacts database connected to your website. Giving you full knowledge if a prospect is looking at your website. I'll say that again, as it was a big deal at the time and still is. HubSpot lets you see which of your contacts are looking at your specific web pages. You can see who is on your website!! The website pages your prospect visits are recorded on their contact timeline; giving you a full understanding as to what they are doing on your site. This is a remarkable sales feature. As a lifelong sales person, and a great believer in providing solutions for customers, this got me. And so began our 2015 inbound journey. In 2015, we committed completely to inbound and HubSpot. So, how did we go with the conversion of our existing website assets? What was our starting place? As a computer geek, I boldly started with the HubSpot Demo in November and December, so I was preped and ready for January 2015, our kick off month (If you would like to be signed up to the demo, click here). Getting into the Inbound Methodology was not hard, thanks to the fantastic teachings of Marcus Sherridan of The Sales Lion. Marcus and his River Pools business has been a fantastic inbound marketing pioneer for years now. In 2014, we reluctantly transferred our award-winning 2009 Flash website to WordPress. After years of developing WordPress websites for customers, we finally treated ourselves to a sophisticated WordPress site. Our original 2009, award-winning Flash website. They say WordPress is used by 20% of the world's websites. This may well be true, but, unfortunately, it makes it a target for hackers. During 2014, our site was repeatedly hacked, causing loads of IT consulting charges and eventually resulting in a very expensive secure hosting requirement. WordPress is open source. It makes it free, but the hidden cost of WordPress is high. The hacking issues cost literally hundreds of hours of wasted IT fixing time. Nobody owns WordPress. Who do you call when you need help? Websites are complicated; so you will need help, and as nobody owns WordPress, there really is no definitive final buck-stopper. This gets relevant when you start throwing in Widgets, plug-ins and add ons from a variety of sources. It does get messy. HubSpot and Wordpress work in similar ways. It was simple to add in the HubSpot plug into WordPress, allowing the HubSpot landing pages, forms and Call-to-Actions to be incorporated in our WordPress site. This was an easy process. HubSpot has a key integration that allows you to be quickly up and running with WordPress. We got started with blogs, it was not hard. Is it worth paying for the HubSpot Website CMS? At first, we didn't purchase this add-on for HubSpot. But, after two weeks of using the HubSpot platform, we knew we needed it. The ability to have a self-contained platform cannot be underestimated. HubSpot has one interface for email, landing pages, websites, Call-to-Actions, forms, as well as integration with contacts. HubSpot Website CMS gives you personalised website pages that can serve data tailored to your customer. Plus, the stats and analytics are much better. Content marketing is cathartic, it’s all about helping your customers by answering their questions. The first thing we needed to do was increase our page count. Our website was talking too much about how great we thought we were, in the absence of helping out actual customers. It's a pretty standard trap for advertising agencies. Content marketing requires attractive content. Which means it has to be attractive and helpful to your customers. We embarked on creating 100 pages of information that provide value. At first, we felt like we were giving away information, but we quickly realised that the internet is all about self-discovery, and we were providing the information for that discovery. I was writing 4 pages a night, getting excited by just a couple of hits in the day. The HubSpot App shows you easy-to-read web visitor stats on an hourly basis, bringing gamification to your mobile. It became seriously addictive watching our website visits increase, and still is today. Guided by the HubSpot keywords tool, we quickly realised that Google Adwords is a lazy way to try and get web traffic. As we increased the number of pages on our website, we saw from the HubSpot sources that we increased the organic traffic to our site. It makes such simple logical sense. Create more pages, and Google will find you easier. Once we got the page count up, we abruptly stopped paying for traffic and have never looked back. By increasing your page count, you increase your Search Engine footprint. It’s logical, yet so many businesses prefer to pay for Google AdWords and SEO rather than invest in improving their page count organically. Google Adwords is like having a broked down car, but refusing to get it fixed and taking a taxi all the time. HubSpot charges their subscription up front (even though we are a partner, we still have to pay for our own HubSpot). It's yearly, so it's a big chunk of cash up front. We cringed at the thought of this, but it turned out to be a big blessing in disguise. The minute we committed to the subscription fee, we went all-in on HubSpot and inbound marketing. Even as an ad agency, previously we had been slack about our marketing. Sure the investment fee was big, but it made us take our own marketing seriously. By paying upfront, we started working harder and the investment has paid off many times greater than than effort. Once we paid, we knew we had to get better to make the investment work. Investments only return if you put in. The month of February 2015 was the first real month for us. We had 1319 website hits, 900 more than the previous average. We had knowledge for the first time where our visits were coming from and quickly learned the value of social media. Does social media really work for business? The answer is 100% absolutely, without doubt yes. HubSpot has the stats to prove it and it makes a huge difference. We are now on track for 5000 web visits in November. Our record day is over 450 hits, and we now growing our organic traffic monthly. HubSpot allows us to publish social media quickly. We discovered that the better the quality, the more love we got. We curated 3rd party content and occasionally added our own social messaging about how we help the customer. As our page count grew, so did our social content. We increased our frequency and got more hits. Make sure you always have a link in your social media back to your website. We discovered people click on links but don't Fan or Like nearly as much. This is a big tip for your business. Make sure that you have a link to your website with all social messages that you publish. Each month (up to the school holidays' effected month of July) we had record website hits. Visits are coming from all over the world now. We have transformed from a local business into a global business. But does the traffic result in more deals? Does having HubSpot result in successful leads? Absolutely. We now know exactly who is in our pipeline and how they are progressing. 12 months after first seeing HubSpot, we now have 1200 people at the top of the funnel, 180 people in the middle and 140 hot/warm leads, with 20 converted customer transactions. We have abandoned paid advertising, and have a website that creates 5-10 leads a week!! Bear in mind, we only managed 3 leads in all of 2014 with cold calling. The HubSpot lead generation revolution is in full swing in our business, with results that are truly remarkable. The Kingdom's website now has over 240 pages. We are working daily to add more, answering our customers questions as they are asked. Gamifying the process has made it both competitive and interesting, as well as profitable. We are now proud of our website, and legitimately feel that it helps our customers and promotes trust along the way. Each day, new people are coming to the site, mainly driven by social media and now organic search, discovering and exploring. With HubSpot, we could see the old customers returning to our website. Some we have had meetings with, and more than one have become a customer again. It's simply unfathomable to think of having a website the old way, not knowing who is on the site. Sales Hub is a great HubSpot app and is remarkable. It shows who is clicking on your emails and the links in real time. It's a priceless app that goes hand-in-hand with your HubSpot deployment. Applying inbound marketing principles to our website totally worked. Creating and understanding TOFU, MOFU, BOFU makes it so much easier to build a website and understand its purpose. HubSpot is powerful, but the inbound marketing methodology really makes a big difference. The inbound strategy makes it so much easier to build a website that gets results. In revamping our website in mid 2015 (this current version), the power of the HubSpot analytics matched with inbound philosophies has made it so much easier to create a great website. We talk about this in one of our most popular blog articles, 8 Ideas You Can Steal From Our Record Breaking Website. As experts in content marketing, the HubSpot marketing library is a complete treasure trove of information that can help any business. Their dedication to the inbound marketing revolution shines through with their customer training. Video content is updated yearly. As partners, we have to do our accreditations every 13 months, providing us a structured training regime to ensure quality. It makes on boarding new staff and customers so much easier with sophisticated video based training and web testing tools. HubSpot subscription charges are higher than Marketo and Infusionsoft, but their back-up and support is world-class. In a corporate world that seems to be intent on shirking customer service by burying help phone numbers deep into a website, it's refreshing to deal with such a helpful company. The Asia/Pac HubSpot team, out of Sydney, have doubled in size since starting in 2014 and are also super friendly. They try their hardest to help paint the world orange. Problem solving is always hard with Mar-Tech. We came from a world of 10 different programs working to do the same thing HubSpot does all-in-one. It's one of the big advantages of having a unified software platform. So much easier to get support. The HubSpot culture is dynamic. They believe they are changing the world (and they are), and this culture shines through at Inbound, the annual HubSpot conference. We went to Boston in September along with 14,000 other Marketeers, it was amazing. Inbound was easily the best conference I have ever been to, and one of the great events to travel to in general. With six world-class keynote speakers and over 200 breakout sessions, it was a remarkable sales and marketing experience. The HubSpot hospitality was outstanding. Why am I speaking so highly of this? The point is that even though the HubSpot sticker price is higher than some of the competitors, the value-for-money proposition is excellent. They are more than just an automated marketing software company; it's clear HubSpot is hell bent on being corporate education and thought leaders. You can't half jump into the pool, and by going all-in on inbound marketing, we fully committed... And the results have come. We now get over 5000 website hits a month, and our website is a huge asset to our business. Inbound marketing works best when management, sales and marketing are all on the same page. The bigger the commitement to the inbound process, the greater the success. We are asked all the time, if HubSpot works. As an automated sales and marketing platform, it is extraordinary. As a cloud based application, the feature set is constantly evolving and has some real power. Ultimately though, return on invesment is what really counts for business. Does HubSpot return value? Yep, in spades. HubSpot is by far the best sales and marketing investment I have made in 25 years of being a business owner. Would we do it again? Without doubt. The million dollar question is: Does HubSpot work? Yes is the answer. Does inbound marketing work? It sure does. It makes great sense, and in practise, once you get the momentum going, inbound is very powerful. Especially if you are willing to put in the investment. Each customer is different, as the starting point for each business varies. Without doubt, we got great early gains just by being better at social media. We are yet to see a business that does social really well, right from the get go. So, there is low hanging fruit that gets good results early for your business, simply by using social media. We have a blog on ways to get quick gains with HubSpot. Each month for us has got better and better, but it's really only been in October/November, month nine, that we can feel the remarkable unstoppable force that is created by content marketing using inbound principles. Each month has been rewarding, but now our website lead generation and deal cycle is really starting to hum. Does the HubSpot investment pay off? Does the HubSpot investment pay off? Well, I guess the proof is in the cheque-writing. We have upgraded to HubSpot Enterprise, with all the upgrades including Ads-Add On, Reporting Add-on and the Website CMS. We have the biggest possible installation of HubSpot, so our licence fee is going to be big - well over $30k annually. Will we sign up again? No doubt whatsoever, it will be the first cheque we write. The investment in new business has been outstanding. Keep in mind, when considering HubSpot for yourself, it will replace other, often inadequate marketing spend that is usually non-performing. We love cloud software at The Kingdom. With HubSpot and the integrations, I'm constantly on the search and lookout for new integrations. We have integrated Wistia, Survey Monkey, Go-to-Meeting, PandaDoc, Google Drive and Sidekick into our portal as well as doing integrations for Shopify and Magento for customers. The HubSpot community keeps getting bigger and bigger, and with this expansion comes more power. How does the inbound/HubSpot story end? HubSpotting and inbound marketing are addictive. It's such a powerful thing knowing you are creating content that is valuable and has longevity. HubSpot and inbound are a palpable investment in the future success of your business. Inbound marketeers are evangelistic for a reason. Each year thousands flock to HubSpot's annual Inbound conference. It's because we really are all onto something. Inbound marketing is internet marketing that actually works. My biggest fear? How are we going to stop or slow it down? Inbound creates sustainable momentum. The more content you create, the better traffic you get. We are going to have 10,000 website hits a month in the next year, no doubt. This is going to bring in more and more business. Double and triple digit growth is on the radar for us as a business. Perhaps the greatest challenge we are going to have is how to deal with all the lead generation. The Kingdom have gone from a sad, slow moving, old-fashioned advertising agency, battling every step of the way. Now we are a global, thriving business - all because of HubSpot and inbound. Will it be the same for you? All businesses are different, so will HubSpot work for you? Our advantage is that we already know marketing. We have learned the lessons of implementation and spent hundreds of hours becoming HubSpot experts. All this on top of 20 years of marketing experience. So, can it work for you in the same way? Well, this is why we provide outsourced marketing services, to make your life much easier. Our outsourced marketing services are valuable, and get HubSpot working to it's full potential. Of course you can get HubSpot working yourself, but it's certainly better if you are dealing with experts. We have honed and carved out our business offering to you, based on our experiences. Knowing what we now know, it totally makes sense to consider outsourcing the whole lot. It took a bunch of skill sets and years of experience from many different people to make it all work well. Far more than any one person could handle. HubSpot and inbound, need effort. But all advertising and marketing need substantial investment. Perhaps the biggest difference with HubSpot and Inbound is that it really does work, and you get the stats to prove it. Regardless of who does the work, the fundamental principles remain. Answer your customers questions, increase your website page count, be bold with social and get HubSpot to tell you who is on your website. Get new leads, nurture them, identify them, and close them. The HubSpot platform becomes such a powerful integral tool though and makes marketing so much more effective. 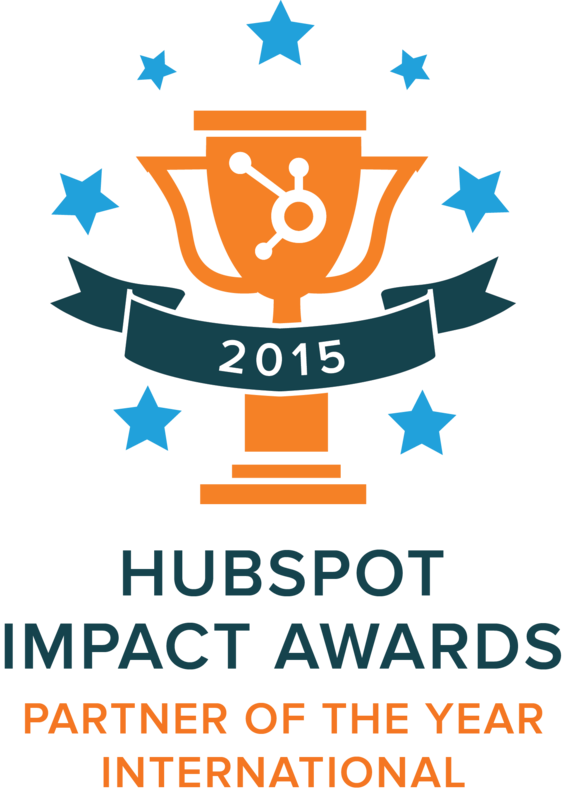 Along the way with our HubSpot 2015 journey, we won International HubSpot Partner of the Year. Naturally it was a big thrill. But, it is fair to say, that nothing beats the adrenaline rush of beating record months and seeing hot sales leads coming into the company, now on a daily basis. We can't stop checking Sources each day, watching our traffic increase and our sales pipeline get bigger and stronger. On the anniversary of our journey, we look back with appreciation on the legacy that has been created and look forward with excitement as to what could be possible. We are now in a sales lead generation place, well beyond what we thought was possible. Would you like to know more about how HubSpot and inbound marketing can help your business? Speak to The Kingdom today, and we can organise a simple 15 minute chat by Webinar on inbound marketing and how it can fire up your website lead generation. We help busy marketing professionals build prestige websites with continuous improvement, so they get value and growth from their technology investment. © 2018 The Kingdom. All Rights Reserved.